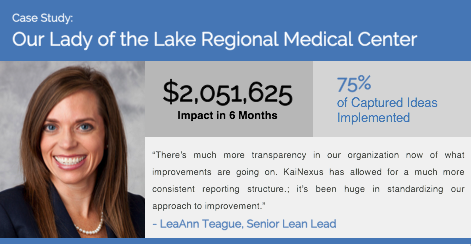 Here at KaiNexus, we often get a peek into some of the truly remarkable improvement initiatives and work that organizations undertake to create positive change for their customers and employees. Recently, KaiNexus Vice-President of Improvement & Innovation Services, Mark Graban, spoke with Lindsey Booty and LeaAnne Teague from Our Lady of the Lake hospital in Baton Rouge, Louisiana. Both Booty and Teague work in the Lean Management Office of Our Lady of the Lake, which is an 800-bed teaching hospital that began using Lean and CAP [Change Acceleration Process] methodology about three years ago. “CAP is change acceleration, we learned it from our GE counterparts when they were here with us in a consulting role, and it helps to ensure that you have the “people” portion of improvement considered. It goes through creating a shared need with your peers and with your team members, making sure that they’re properly bought into the change, ensuring that systems and structures around the organization are set up to make sure that the changes are sustained throughout improvement. It really helps us to get aligned with the “people” side of improvement that’s often left out when you just look at quality solutions,” Booty said. A big part of Our Lady of the Lake’s improvement efforts centered around Lean boot camps they hold bi-annually. However, in 2017 a new electronic medical records (EMR) system was installed at Our Lady of the Lake, which represented separate improvement work that needed to be completed. Business case, outlining why the project important to the organization. Leaders and managers were invited to participate in the drive several times through announcements at meetings and publications. The goal of the improvement drive was to collect ideas and very strategic projects for the upcoming Lean boot camp, which would make sure the organization was working on some key priority projects for the organization over the next six to nine months, Booty explained. The process for selecting projects to be worked on in the boot camp was extensive. First, an inter-departmental Lean team looked for project viability using a benefit-effort matrix, to get a rough estimate of the benefit of each of the projects would provide measured against the effort it would take to accomplish it. This would lead to recommendations given to a senior leadership team, who would then review the projects in two stages. This team would ensure the projects are aligned with organizational priorities and that they would agree to appropriate resourcing for those areas. This team also ensured the project had the right executive sponsor commitment, which is an executive manager willing and able to champion these improvements. Each project also had to have an identified process owner, someone to take ownership and carry the torch after the change is put into effect. A coach from the Lean Management Office was also assigned to each project. The bandwidth of the project location was also considered, weighing carefully what was going on in those areas right down to construction, and so that leaders could be sure the space could support a strategic project compared to the need for the project. Finally, the senior leadership team discussed who was the appropriate project facilitator. “The way we did that was via a match day. We had our Director of Leadership Development come to the senior leadership team with a proposed list of facilitators for projects that had not previously been trained in Lean and change acceleration methodology, that we would put through our Lean boot camp and partner with the project to execute the project whether they lived and typically worked within the project area or not,” Booty explained. Once the senior leadership team completed all that, they then handed their recommendations to the Lean Management Committee for their final stamp of approval on the chosen projects. Booty and Teague explained that KaiNexus is used in all of their improvement strategies to date, including training. 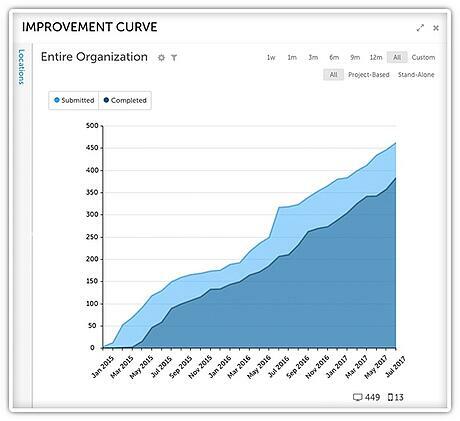 "KaiNexus fit perfectly with our improvement strategies. We are able to use it at any level in the organization. 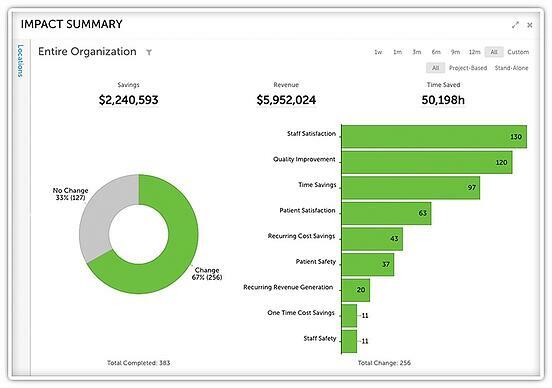 In the two years that we’ve been using the system, we have seen such an increase in performance improvement around our organization." “KaiNexus fit perfectly with our improvement strategies. We are able to use it at any level in the organization,” Booty said. "I've never seen such quick responses from a support vendor as we do from KaiNexus." “We also, probably in the fall, hope to really lead one or two of our units in the hospital to perform a pilot where we really focus on that bottom-up improvement area and see where KaiNexus can be of more value to us there,” Booty said. For more information, be sure to listen to the interview! And if you have any questions for Booty and Teague about their journey or results, leave a comment below.